HELCO is now reporting that customers in Waimea from Lindsey Road to Ahualoa are advised to prepare for an extended outage of up to three days. Hawaii 24/7 is still receiving reports of power outages along the Hamakua Coast in Paauilo and in the Halaula area of North Kohala. According to Hawaii Electric Light Company’s Twitter account crews have been responding to various power outages on the Big Island due to the strong winds. At about 11 p.m. HELCO reported about 2,180 customers were without power in the Waimea area. Crews were on their way and responding to Waimea. 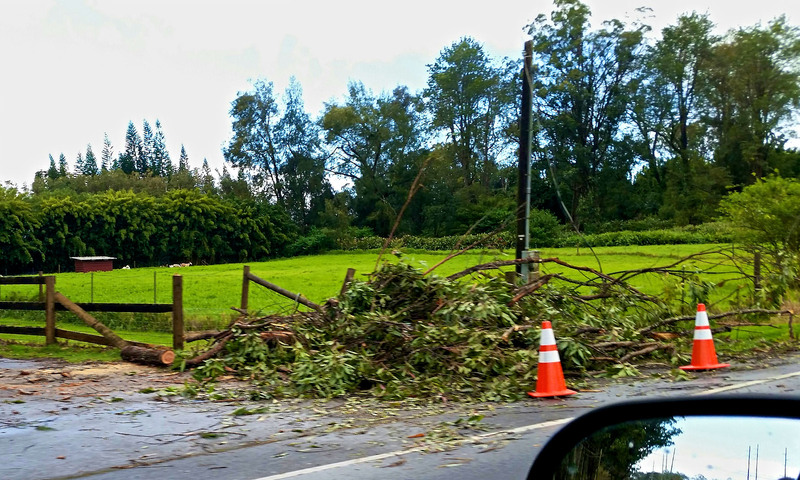 Hawaii 24/7 recieved Twitter reports from people in the Waimea area still without power Saturday morning. Reports of power outages in the Hamakua Coast areas of Papaikou, Ookala, Paauilo and Honokaa. Power is also out for about 1,385 customers in Puna in the Kaohe Homestead Road, Leilani Estates, Lanipuna Gardens areas due to problems caused by the wind. Crews have been sent to the area to get power back on. In the afternoon about 2,665 customers in Hawaiian Paradise Park, Orchidland, Ainaloa and Pahoa saw outages but had their power restored according to a 4 p.m. report by HELCO. We have reports that power has been going off and on in the Waiakea Uka area. HELCO asks that people report their outage to their trouble line at 969-6999 so they can alert their crews. The National Weather Service in Honolulu has issued a Wind Advisory for the Big Island due to a weather system passing through the islands. For more information on the Wind Advisory visit here. I live in Volcano, our power has been out since Friday at about 8:30pm. I have tried to call the outage line many times, the recordings address jan 1and 2 power outages. I have never been able to leave a message or speak w anyone. I would just like to know what is going on. I live at 11-3151 Alaula st. Are you even aware we have no power? I also live in the volcano area on Alii Kane. I called Helco 3 times n did speak to different females. All I got was “we cannot give an estimated time the electric will come on n the last one at 7pm was they the crew was in waimea. The female told me to find resources to help with ice n water. If the damage is from the trees fallen by Glenwood. Why does it look as if they cut it but didn’t even fix the lines?? They didn’t have power restored until about 4pm in Kapaau!! That’s crazy, when it had already sparked up briefly, twice, before even 10am, then nothing for over 5 hours? !